Happy New Year! This year is going to be fabulous, I can feel it! I have a long list of New Year’s crafty resolutions and I hope I succeed in them this year, one of them being getting organized. You have no idea how messy my area has become. But no matter what, I shall and need to craft on! To kick off this crafty year, I bring you this month’s newest Altenew Build-A-Flower: Hyacinth! I thought this set was so beautiful at first sight! The layering is perfectly designed, and it was so easy to create the hyacinth bouquet. For the larger stem, I used the Tea Party Collection inks for the flowers, which includes Pink Pearl, Coral Bliss, and Heart Beat. The smaller floral stem was stamped with the Red Cosmos Collection inks, which includes Frosty Pink, Coral Berry, and Ruby Red. After I stamped the floral parts, I die cut the images out before stamping the leaves. The leaves were stamped in the Tropical Forest collection which includes Bamboo, Parrot, Olive, and Moss. I used a bit of ombre inking for the leaves to give it a more natural look. I went for a simple ink blended background using Peeled Paint and Abandoned Coral distress oxide inks. I overlaid this blending with a foliage frame created with the Leaf Frame Cover Die out of white card stock. I realized about this part of the process that I had forgotten to give a spot for my sentiment. I decided to heat emboss the sentiment from the Hyacinth stamp set in white onto Desert Storm Neenah card stock and trimmed it down to a strip. I cut the two line sentiment into separte strips and then for each half, tucked it behind the flower to create the look of one long strip. And that finishes up my card! 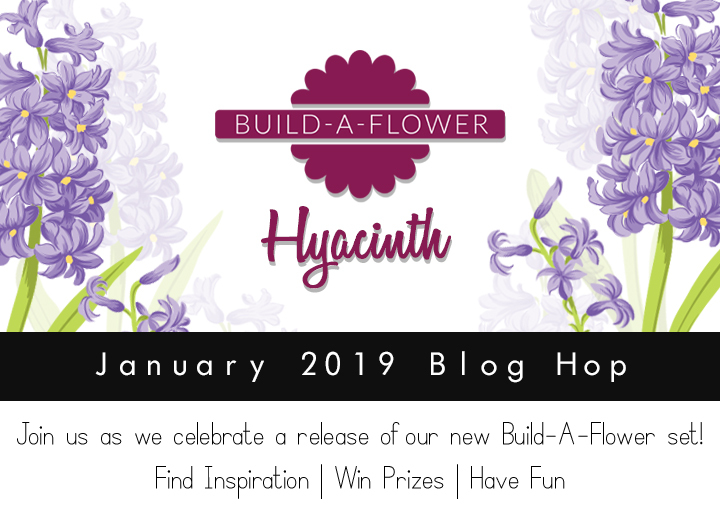 This post is part of the Altenew BAF Hyacinth January 2019 Blog Hop! If you’ve been hopping along with us, you would have arrived here from Lilith’s blog and your next stop is at the Altenew Scrapbook Blog! 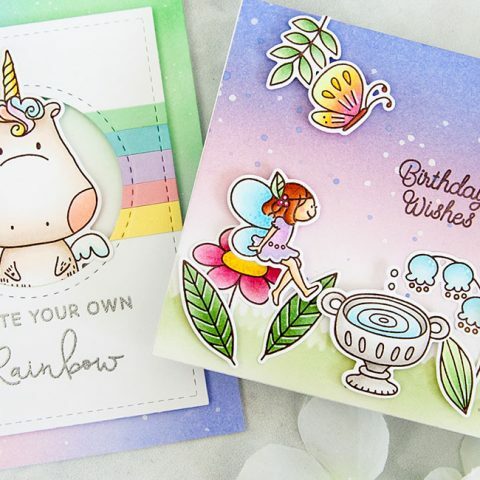 You can find the full blog hop list or start at the beginning from the Altenew Card Blog. To celebrate this release, Altenew is giving away a $50 gift certificate to 6 lucky winners! 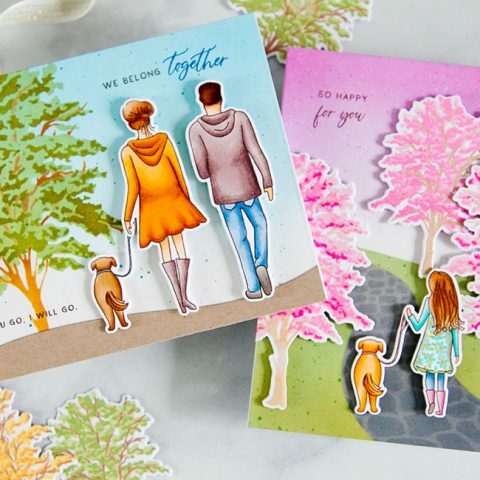 Please leave a comment on the Altenew Card Blog and/or Altenew Scrapbook Blog by 1/8/2019 for a chance to win. Six winners (3 per blog) will be announced on the Altenew Card Blog and/or Altenew Scrapbook Blog on 1/9/2019. A winner will also be drawn for a $20 gift certificate to ONE lucky winner from this blog post! Please leave a comment on this post by 1/4/2019 for a chance to win. Winner will be posted in the Giveaways Page on 1/5/2019. UPDATE: Congratulations Brenda Abbott! Please e-mail winner@altenew.com by 1/15/2019 with the subject line “Altenew BAF: Hyacinth Release Blog Hop Winner from Keeway’s Blog” to claim your prize! So pretty! you can’t go wrong with this stamp/die set. The hyacinths are just lovely. Happy mistake! I love what you did with the sentiment!!! Beautiful card. I like your color choices & really like the background die that you used. Just wonderful. Beautiful card – I love that softly inked background and the framing. Fantastic composition! 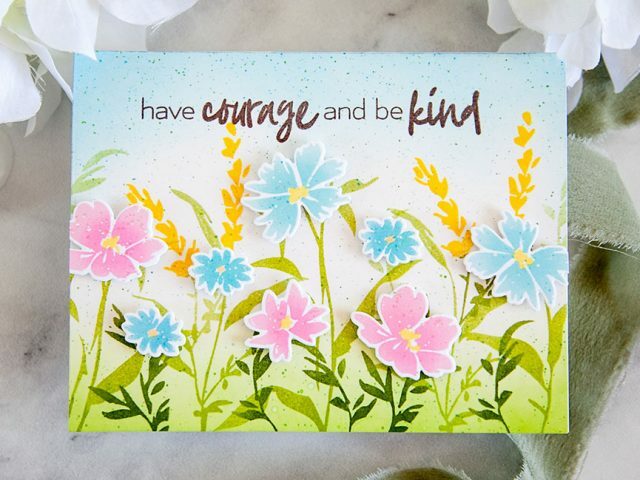 Oh, the flowers are beautifully stamped but the ink blending background and the slim sentiment tucked in grabbed my attention! Bravo on those extra details!! Love the color combo. Beautiful card! Lovely! Beautiful colors and layering. Thanks for the great ideas. I love how you included the frame. Great card! Another beautiful card design from the set. So many ideas! Where do you start? Love the colors you chose and the die cut background. Beautiful card!! There seems to never be any mistakes in card making! Great job! A gorgeous card! Love the background and the colors you used. The new BAF set is so pretty. 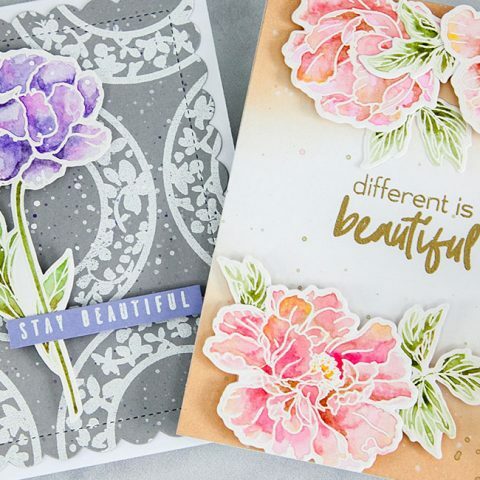 Your card is stunning.What a beautiful floral stamp set.I love the Build a flower stamp sets.So realistic. Beautiful card and layout! Love this set! 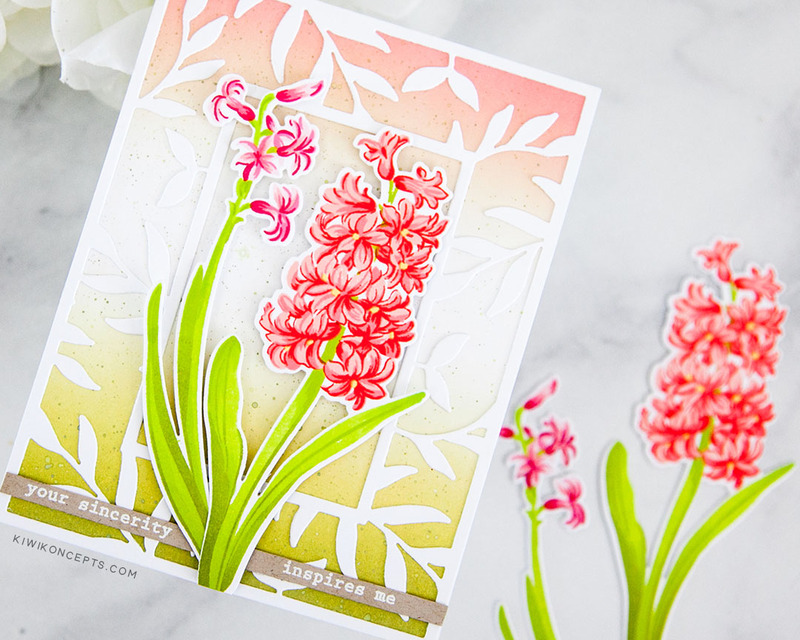 This hyacinth stamp set is so beautifully made. It looks so realistic when you’ve layered it. Obviously, you are very good at layering them. I so like the colours you’ve chosen both on the flowers & the background. I also think that Leaf Frame Die was the perfect choice. Just beautiful Keeway! Happy New Year! Your creative use of the background die and coloring just made this pop beautifully… a nice, clean, fresh approach! Happy New Year! Absolutely beautiful card!!! Hyacinths are my favorite spring flower. Definitely need this set in my collection! Beautiful set. You did a great job on your card. Very lovely project! Beautiful combination of stamps and dies!! Beautiful car! I love the color you chose to use for the flower! Thanks for the inspiration! Gorgeous card and love the new Build-A-Flower set! Love your card and the use of the leaf frame with it! 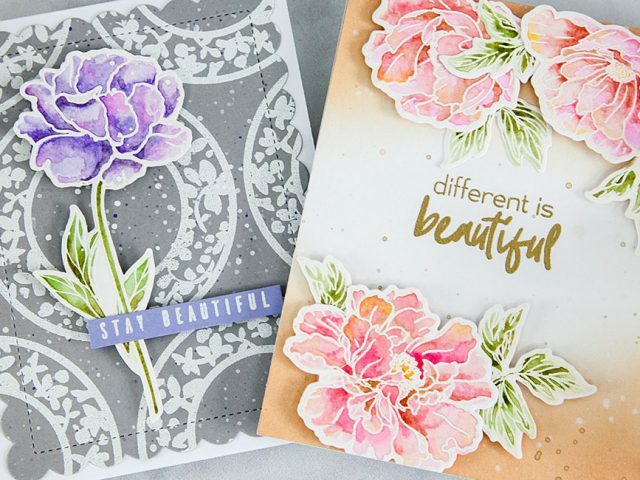 I love the background you created with the ambre ink and the botanical die cut! Very clean and simple! And the colors you used for the flowers are so bright and cheerful! Beautiful design! 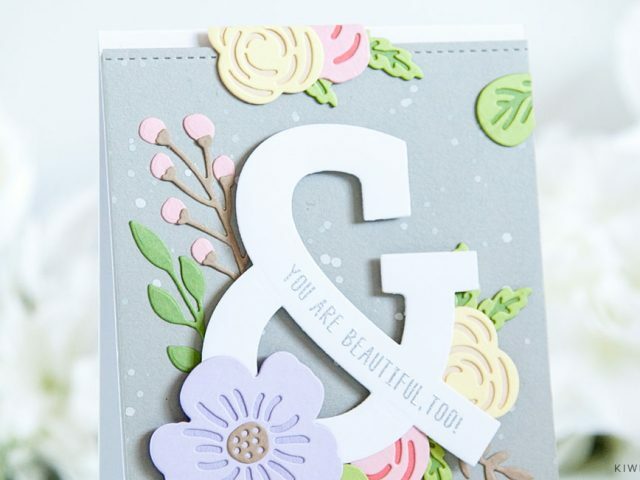 Beautiful card – I love your choice of colours! Wow! I love the gorgeous color in your hyacinth! That pretty pinkish coral looks amazing! Just WOW! Great colors! SOOOOOOO PRETTY! I love how the background colors tie into the hyacinths! Such a beautiful card that keeps the focus on the flowers! Beautiful card! I have that pretty cover die. I like it a lot. This is so pretty and I love how the sentiment came out. Sometimes our mistakes are the best ones! The colors you chose for the hyacinth are stunnng—and the leafy frame is perfect to show it off! I often forget to plan for the sentiment too, but you aced it here! Love the color combination that you used. Very pretty card. Love those sweet coral tones. Wonderfully soft! I really like your beautifully inked background, and great choice of the frame to highlight the hyacinth. Lovely card. Thanks for sharing your talents and inspiration. Such a lovely card using a gorgeous flower . This is beautiful!! Love the colors and your design with the leafy diecuts in the background. Beautiful color choice! Love your card design. Love this pretty card. The hyacinths look really gorgeous against the background. And I love the way you have added the sentiment. It really stands out against the busy background. So pretty! Love the ombre background. Gorgeous! The leaf frame die so beautifully compliments your stunning blooms. Fabulous color combination. Love how you framed the flowers! Your card is absolutely gorgeous. 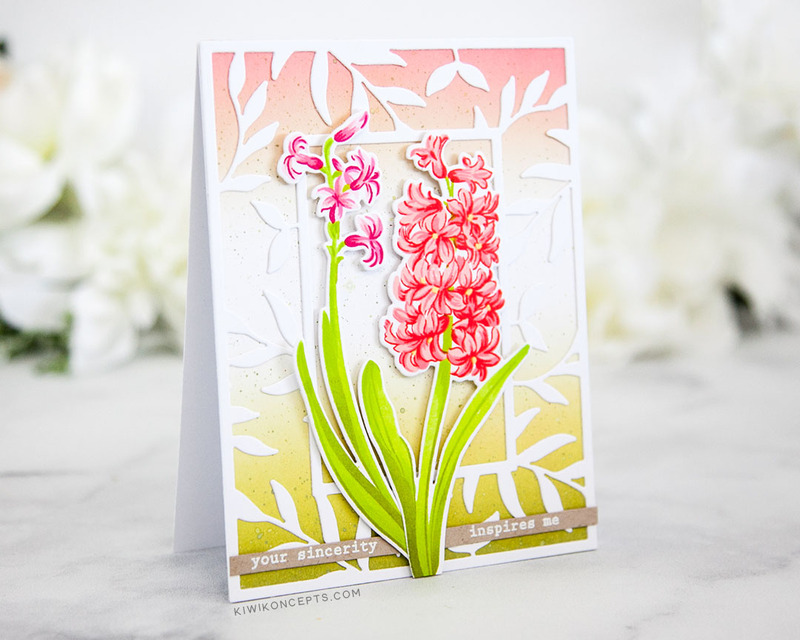 I love the background with the soft pink and green colors and your hyacinth is beautifully framed with white cardstock. Thanks for the inspiration. Another gorgeous set! Love your pretty card Keeway!! Thanks for the inspiration and happy new year! The background complements the lovely hyacinth. Pretty card! Gorgeous card. I love how you used the leaf cover die in the background. I love how you used similar colors for the background and the flower. This is very pretty. Your design looks great. I love the crispness of the detailed stamp. Thank you so much for sharing. Very beautiful card and the different colors. I also love Altenew’s layering stamps. Have a beautiful day. The sentiment looks perfect so don’t worry to much! I can’t believe how detailed the layers of this set are, it makes the Hyacinth look so real. I love the colors you used for your background and the flowers/leaves, very cheerful and feel good. Your talent inspires me, thank you for sharing your card and Happy New Year. The frame and die cut really help the hyacinth pop. Great job! The inking on the background is spectacular. You are an amazing artist. 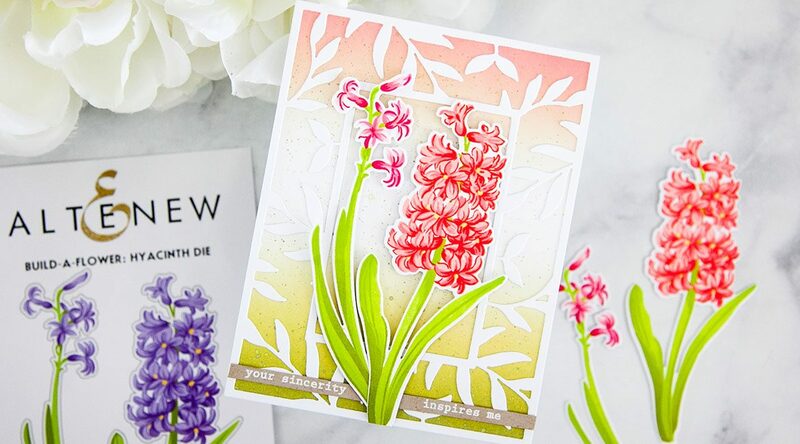 LOVE the inky dimension of your hyacinths, LOVE the pretty layers of your design, including your sweet sentiment strip! 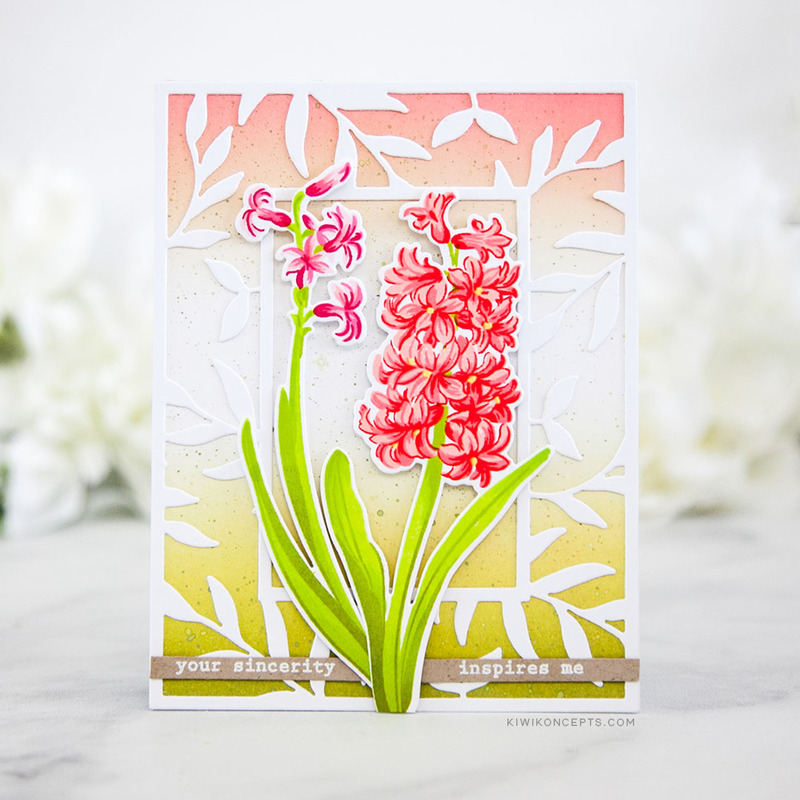 I love you bright springy Hyacinth card! And I also agree about how great the layering of the flower was designed!I just can’t wait to play with the set! 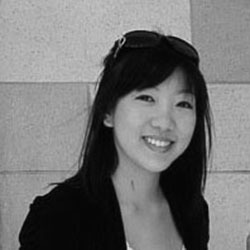 Thank you for sharing your techniques with us! Happy New Year ! Stunning card, gorgeous colour combinations on each flower. I’m hoping for a more productive crafting year & a healthier one. Here’s to both of us getting our wishes. Thank you for sharing inspiration. So pretty! I love your colors. Your card is SO beautiful! Love the colors and design! This is so pretty! Love the way it layers! Thanks for the beautiful inspiration! Beautiful card. Love the way you used the leaf frame to frame your flowers. Thanks for sharing! Gorgeous card. I love the colors and the magnificent new hyacinth set — just beautiful! Keeway I love everything about your beautiful card – the colours, the fact that you used a background die – just gorgeous. 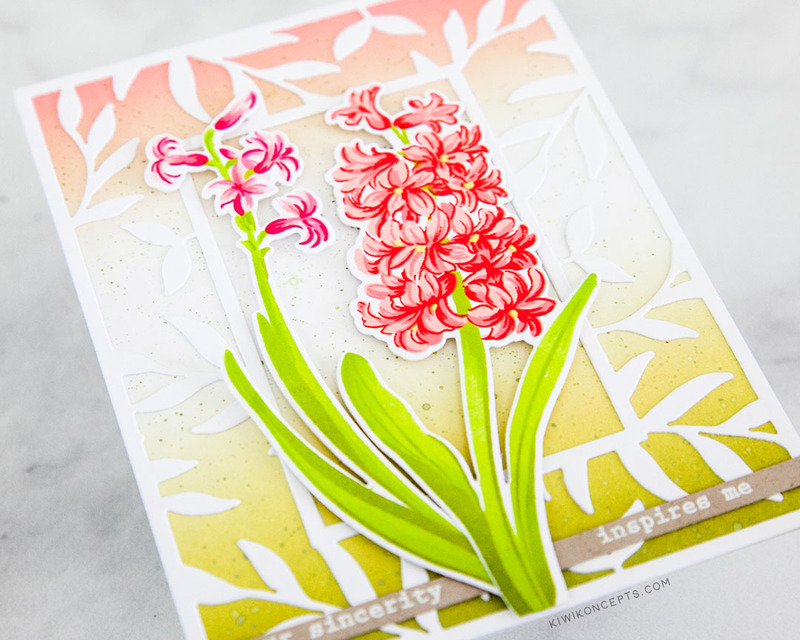 Thanks for sharing your take using this beautiful new hyacinth stamp and die set. Love it! Very beautiful card. Your color choices were amazing. This card just shouts: “Spring!” I can’t wait to try it. What a lovely color combo for this new flower set! So perfect! Love this new Build-a-Flower set. 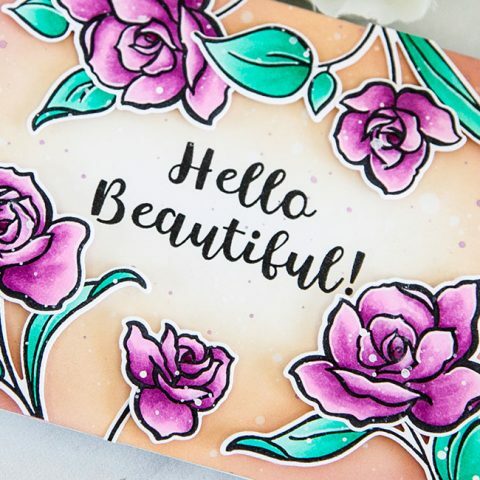 Your card really shows off the beauty of this stamp setT Thanks you for sharing your creativity with us! Such a happy card! Bright and cheerful! 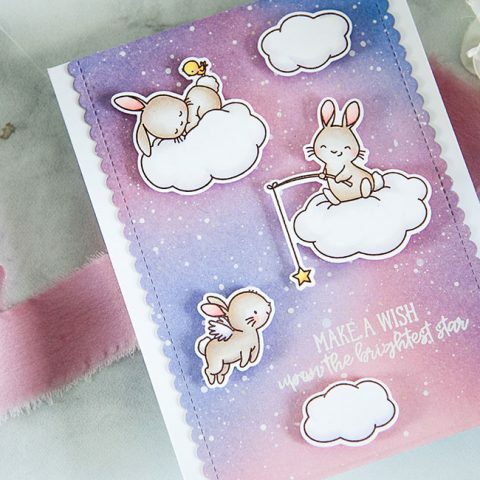 Such a cheerful happy card! Your card is gorgeous! I love the blend of colors you chose! I usually think of hyacinths in the cool colors, so it’s fun to see them in the warm colors. And I love what you did with the background. It’s really subtle and striking at the same time. Thanks for sharing! Wow! What a gorgeous card! I love the background, the design, the colors, everything is so beautiful! The cards just keep getting better and love the variety from all you talented card makers. I believe you are correct. This is going to be a great year and you sure started it off with a lovely card. I like how you used different colors on each flower stem. Great job! Hi Brenda! Congratulations, you’ve been randomly selected as the winner for the $20 gift certificate to Altenew! Please e-mail winner@altenew.com by 1/15/2019 with the subject line “Altenew BAF: Hyacinth Release Blog Hop Winner from Keeway’s Blog” to claim your prize! Gorgeous card! Love the background die and the stamp set. Gorgeous card! Love this newest BAF set! Gorgeous!! Thanks for the inspiration!! Beautiful card! Love the inking and of course those gorgeous flowers! Lovely card, beautiful background too. Thanks for sharing! luv that you used the leaves cover die in the background! Really like the composition of the card and the colors used! Love the framing and the bright colors. Gorgeous card! I love the background! What a gorgeous card! 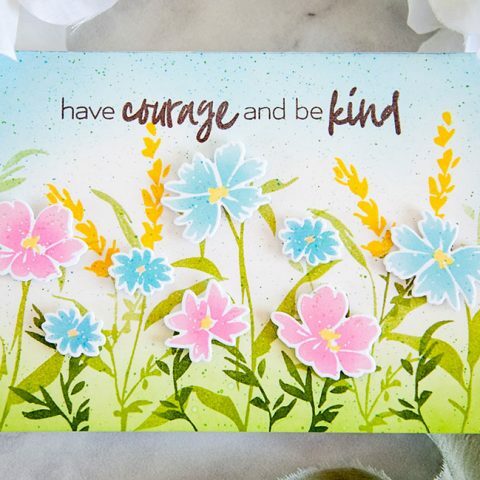 I love the Leaf Frame Cover Die background for the flowers – perfect! This card is simply amazing! I love everything about it. Gorgeous and congratulations to Brenda Abbott! Thanks so much! I am thrilled to be so blessed.